Carrots: Your beautiful, crisp, and sweet carrots were direct seeded into the fields back in late February in order to ensure an early harvest for your share this spring. Enjoy them fresh as a snack or in any of your favorite salads or cooked dishes. Fennel: Fennel plants are cultivated for their bulbous and succulent base, and their feathery fronds are also edible and delicious used as an herb. Kale, Lacinato: This deep blue-green kale, commonly known as Dino Kale or Italian Black Kale, is delicious in any dish that calls for kale. Scallions: Scallions (a.k.a Green Onions) are back for a second season. These tasty shoots are a great addition to soups, salads, tacos, baked potatoes, or as a garnish for most dishes. Turnips, Hakurei: This is the last time this spring you will see these sweet Japanese turnips. Enjoy them fresh or cooked, and look forward to seeing them in your shares again this fall. 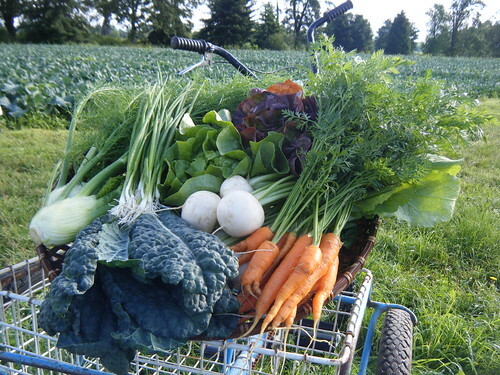 In 2008 SIO researched produce bag usage for the CSA program, and we were shocked to learn that SIO and its members used nearly 16,000 bags during that season. For the 2009 season SIO kicked-off its first campaign to try and reduce overall produce bag usage, and challenged our members to reduce our use by 25%. We are excited announce that during the 2009 season we reduced our usage by 27%. We’d first like to thank all of our members contributing to that overall reduction in bag use, it really did make a difference! Despite our overall reduction in use, as a community we still used approximately 13,000 produce bags during the 2009 season. That breaks down to 33 bags per share for the season, or 1 to 2 bags per share per pick-up. For the 2010 we again challenge our SIO members to reduce their produce bag use by 25% by bringing your own bags, using one bag for several items, and reusing produce bags when possible. We will happily continue to provide produce and paper bags and at our bulk sites (and when needed in box shares) for the convenience of our members, but appreciate any efforts in reducing overall bag use at SIO. 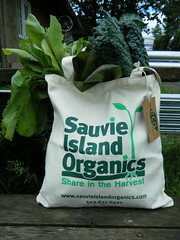 New this season, SIO has organic cotton canvas totes for sale for $6.00 (see in photo above). They are a great way to show your SIO pride, carry your produce in style, and reduce your overall bag use over the course of the season. If you are interested in purchasing a tote please email us or talk to Peter at your bulk pick-up site. Remove leafy tops of fennel bulbs. Slice trimmed bulb crosswise into thin, bite-sized slices; place in a bowl. Section oranges into a bowl, squeezing in extra juice as well. Stir in lemon juice, olive oil, salt and pepper to taste. Cover and refrigerate at least 20 minutes. Makes 4-6 servings. Cut each fennel bulb into 8 wedges, but do not remove the core. Bring water to a boil in a large saucepan, add the fennel wedges and cook for 5 minutes. Remove with a slotted spoon and blot with a towel. Heat butter and oil in a large cast-iron or nonstick skillet over medium-high heat. Reduce heat to medium; add the fennel and cook, stirring, until nicely browned on all sides, about 8 minutes. Transfer to a dish. Add the onions to the pan, sprinkle with sugar and cook, shaking the pan back and forth, until nicely browned, 4 to 6 minutes. Return fennel to the pan along with the carrots and 1 cup broth. Season with salt and pepper and simmer, covered, until vegetables are tender, adding more broth as needed to keep the stew moist, 15 to 20 minutes. Garnish with fennel fronds. Serves 4 as a side dish. Soak the beans overnight. Then next day drain them and put them into a heavy-bottomed pot with the bay leaf and thyme. Add the onion and carrot, peeled. Cover with water or stock and bring to a boil. Reduce to a simmer, skimming off any foam that forms on the surface. Cook the beans until very tender, from 45 minutes to 2 hours, depending on the age of the beans and how long they were soaked. Salt the beans generously once they start to soften. When fully cooked, remove from heat. While the beans are cooking, wash, trim, and chop the greens. Finely chop the garlic cloves and gently sauté them in the olive oil with the rosemary, about 1 minute. Add the beans and about 1 cup of their cooking liquid, and simmer about 5 minutes, until some of the beans have crumbled apart. Add the greens to the beans, and stew together, uncovered, until the greens are wilted and tender. Add more of the bean liquid, if needed, to keep the vegetables moist and a little soupy. Taste for seasoning and grind in some pepper. Serve with extra-virgin olive oil drizzled over the surface. Serves 6 to 8 as a side dish. Also delicious served as a sauce with pasta. Sauté the scallions in the olive oil for 3 minutes. Add the carrots and continue cooking until vegetables begin to soften and turn golden. Add butter, soy sauce and sugar and cook 30 more seconds. Enjoy. Dice bacon and sauté in a skillet until half cooked. Pour off excess fat. Lower flame. Add butter, peeled raw shrimp, scallions (chopped fine), and season and to taste with salt and pepper. When the shrimp are turning pink, add lemon juice and 2-5 dashes each of Tabasco and Worcestershire Sauce. Serve over couscous, quinoa, or pasta if desired. Preheat oven to 400˚F. Prepare the carrots and turnips so they are about the same size and shape (you may leave up to a ¼-inch of their tops on if desired). Cut carrots into 1/8-inch slices on the diagonal. Halve or quarter the turnips lengthwise, and slice into 1/8-inch-thick pieces. In a large bowl, toss the carrots and turnips together with the olive oil, and season generously with salt and pepper. (Taste a raw vegetable to check seasoning.) Spread the vegetables evenly in a baking pan in a single layer, and roast, uncovered, stirring and tossing occasionally, until the vegetables are cooked through and caramelized, 20 to 45 minutes. Serve as a side dish with roasted meats or chicken, or on top of creamy polenta for a hearty vegetarian meal, sprinkled with fresh chopped herbs. Serves 4 to 6.